In a baking dish arrange fillets in single layer.Brush with lemon juice, sprinkle with garlic and dill. Bake for 15-20 minutes or until fish is opaque and flakes easily with a fork. 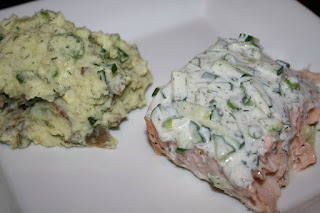 cucumber sauce: Meanwhile, in a small dish, combine yogurt, cucumber, onion, dill, garlic, salt, and pepper to taste; mix well. Spread over fish and return to oven to heat up the sauce on top of the fish about 2 minutes.